Do YOU Struggle to get the kids (and adults) to eat their veggies? Make the Delivery System FUN with this new Fry Box Bigz Die! These are ideal for birthday parties, pool parties, BBQ's and your daily snacks (what a fun way to jazz up their lunch boxes). With a fun and fast die, you can personalize a fun way to eat healthy snacks and it will perfectly match your decorations or theme. This fun post is from last month's Gettin' Crafty Stampin' Newsletter... I couldn't help re-posting! 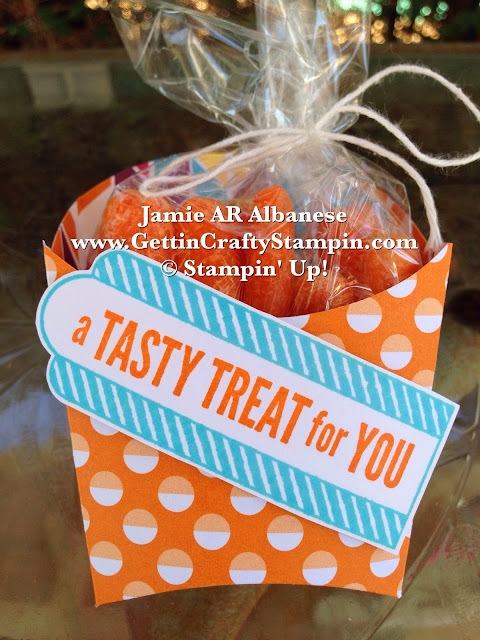 Sign Up for this tutorial filled Gettin' Crafty Stampin' Mailing List and receive WOW project tutorials emailed directly to YOU - for Free!! 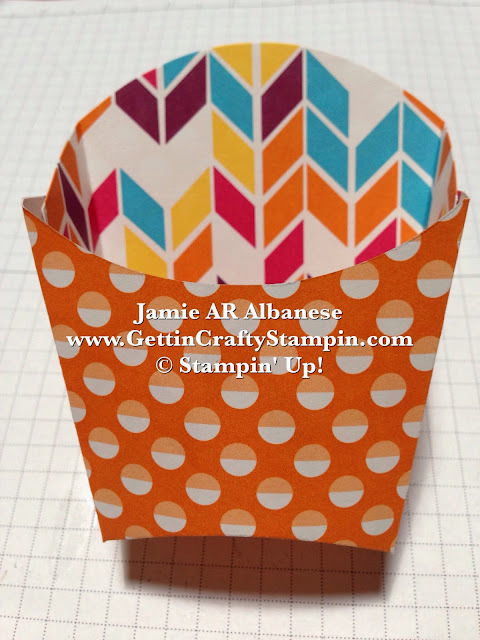 Cut a strip of the Sweet Taffy Designer Series Paper to a 5" Strip with the Stampin' Trimmer. Cut the shape out with the Fry Box Bigz and Big Shot Die-Cutting Machine. Adhere the sides using the Fast Fuse adhesive (for an extra-strong hold). Fill a 4"x6" Cellophane Bag with fruits/veggies (here I used carrots). Place a dip or hummus in the bottom of the bag before if you want to add a dip. Tie the Cellophane Bag with the Whisper White Bakers' Twine with a cute bow. Stamp the Fast-Food Friends tag in Tempting Turquoise ink on Whisper White card stock. 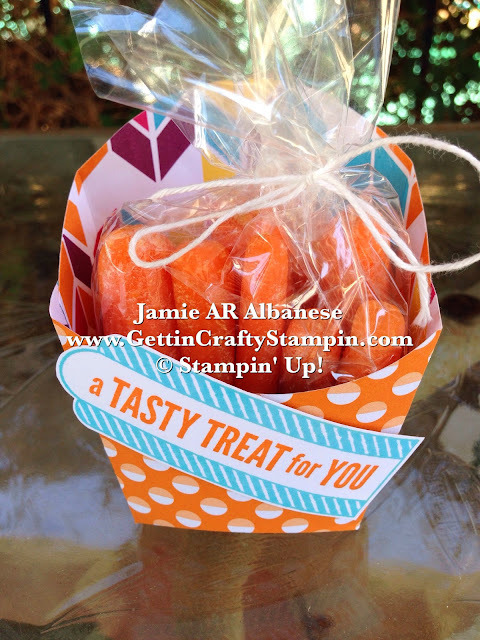 Stamp the 'a Tasty Treat for You' sentiment on the inside of the tag with Pumpkin Pie ink. 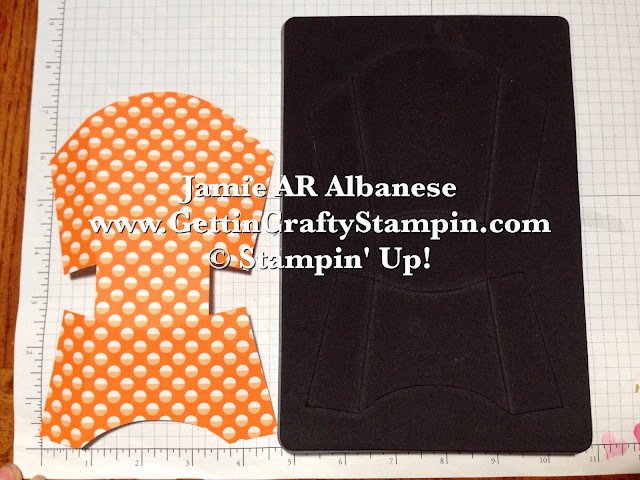 Cut out this tag with Paper Snips. Adhere to the Fry Box with the Stampin' Dimensionals. Add yummy dips, hummus, guacamole, etc. to the bottom of this bag before adding the carrots/veggies/fruit and have a contained treat that is sure to delight! Watch Adults and Kids grab these handy, fun, colorful snacks at your next function and find smiles abound as they crunch some healthy snacks. 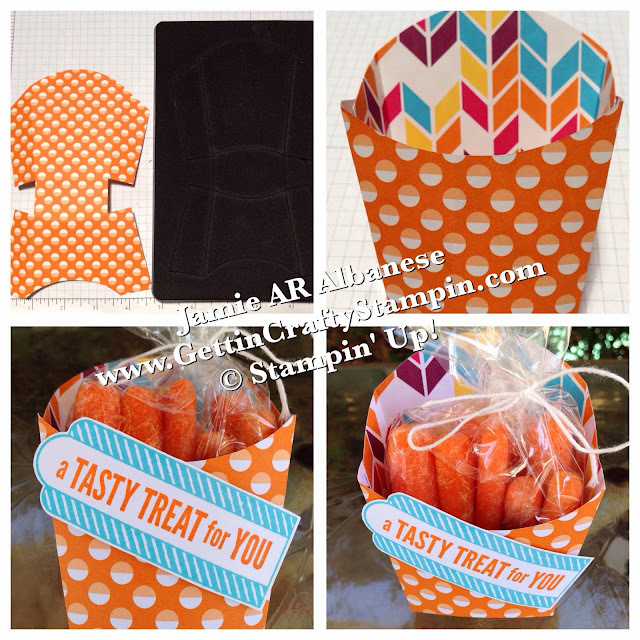 This holder is a great way to hold gifts at a party, condiment packets and more. A MUST at every BBQ, Pool Party and Gathering (or add fun to your kids lunch boxes). Eating their veggies while you look like a rock-star - it's a win-win!